The Family and Federal Circuit Courts have been spared the full force of the budget axe, despite being in line for cuts of up to $30 million. This comes when warring couples face delays of up to two years to resolve family disputes and after the Attorney-General George Brandis was handed a ­report by KPMG on court performance and funding. The budget removed almost $4m in government funding from the courts — a cut of ­2.5 per cent. The courts’ chief executive, Richard Foster, said the reduction from $152.6m in 2013-14 to $148.8 in 2014-15 formed part of the commonwealth’s ongoing efficiency dividend. Mr Foster said the courts were waiting for the government’s response to the KPMG report to determine their future funding and resources. “The outcome of that report will provide the most significant understanding on how the courts continue to deliver services,” he said. The Coalition vowed before the election to save $30m by “streamlining” Family Court processes. However, barristers and solicitors have warned that the courts’ stretched resources are causing delays to family hearings and compromising the welfare of children and women at risk of violence. 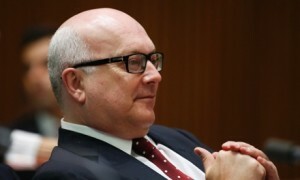 Senator Brandis said he was committed to ensuring the courts operated as effectively and efficiently as possible, and could provide “easily accessible services” for the resolution of family disputes. “The courts need efficient and sustainable funding models to ensure they can serve the Australian community effectively, even in times of fiscal constraint,” he said. The government was considering the KPMG review and the Productivity Commission draft report on access to justice and had sought the courts’ input. Opposition legal affairs spokesman Mark Dreyfus said all courts were under pressure to deal with disputes in a timely way with limited resources. However, delays caused by a lack of available judges were not acceptable. “The saying justice delayed is justice denied is particularly true of family law matters, where the uncertainty of protracted litigation can only aggravate an already difficult situation that frequently arises in family law disputes,” he said. Greens legal affairs spokeswoman Penny Wright said the Attorney-General needed “to be honest” about whether he ­intended to cut $30m from ­family law processes. Calling for urgent action to ensure the courts and legal assistance were properly funded, Senator Wright said the government needed to take account of the indirect costs of court delays, including the impact on families and mental health. “The justice system is fundamentally broken when people are waiting up to two years to resolve family law disputes,” she said. The Law Council of Australia this week hit out at the Coa­lition’s decision to cut $15m in funding to legal aid services. Law Council president Mic­hael Colbran QC said what was needed was an additional $80m for the chronically underfunded services.